Hans Christian Oersted discovered the magnetic effect of current in 1819 AD.When an electric current is passed through a conductor, it behaves like a magnet. This is called magnetic effect of current. The area around which the magnet can influence other bodies by its magnetic force is called magnetic field of a magnet. A current flowing through conducting wire also has a magnetic field around it. To find the magnetic field around the wire carrying current, we can use the right hand thumb rule. According to the rule Thumb points the direction of electric current and the rest of fingers give the direction of magnetic lines of force around the wire. The tangent at any point on the lines of force gives the direction of magnetic field at a point. When electric current is passed in a circular wire adjusted as shown in the figure, the iron fittings scattered on the cardboard adjusts in rings, when the board is hit gently. The rings show the lines of force around the wire. A spiral adjustment of an insulated wire is solenoid. When electric current is passed in it, It shows two magnetic poles as in a bar magnet. Its poles can be determined by the right hand’s grip rule. It states that if the solenoid is gripped by right hand in such a way that the fingers are in the direction of current flowing in the wire, the thumb will point the north pole of it. The opposite pole will be the south. When an electric current is passed through a conductor, it behaves like a magnet. This is called magnetic effect of current. The area around which the magnet can influence other bodies by its magnetic force is called magnetic field of a magnet. A spiral adjustment of an insulated wire is solenoid. What is meant by magnetic effect of current electricity? When the current flowing wire is kept along a side of a compass needle, then the needle will be deflected during the flow of current through the wire. The result shows that the magnetic field is developed due to the flow of current in the wire that affects the compass needle. 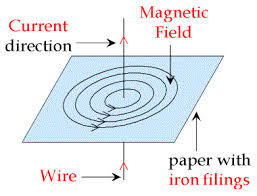 That type of effect of current on magnet is called magnetic effect of current electricity. How does a solenoid behave like a magnet? A solenoid is a long coil of circular loops of insulated copper wire. 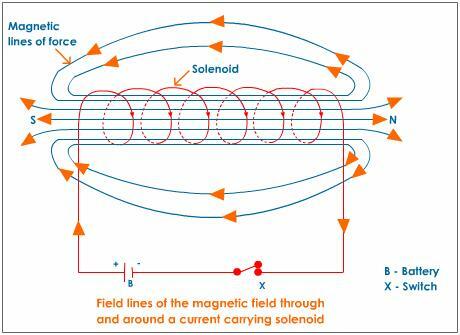 Magnetic field lines are produced around solenoid when a current is allowed to flow through it. 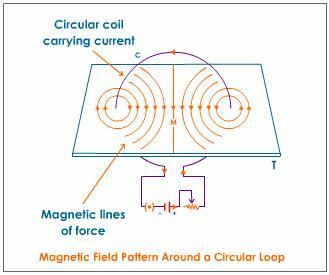 The magnetic field produced by it is similar to bar magnet. Can you determine north and south poles of a current carrying solenoid with the help of bar magnet? Yes, we can determine the poles for a current carrying solenoid with the help of bar magnet. If the magnet when kept near to solenoid gets repeled then we know they are of same poles and if bar magnet gets attracted then we can say they are oppostie poles as opposite poles attract each other. When is the force experienced by a current carrying conductor placed in a magnetic field largest? The force experienced by a current carrying conductor is highest when the direction of current is perpendicular to the direction of the magnetic field. A magnetic field line is used to find the direction of ______. The magnetic field lines due to a straight wire carrying a current are _______. The magnetic field lines inside a long, current carrying solenoid are nearly ______. The direction of the force on a current-carrying wire placed in a magnetic field depends on ______. Who first discovered the relationship between electricity and magnetism? Any Questions on 'Magnetic Effect of Current '?